I have no idea what happened to March. It was here, then it was gone. April seems a little more grounded, rooted, and thriving. The shop is buzzing with sales (use the code SPRING at checkout for 15% off until May 1, 2013) and sashiko items have been flying out the door. Going through my stock this week I found notes and inventory lists from 2010, a year or so after I first starting selling sashiko supplies. Over the years I’ve taught myself sashiko, taught classes, written articles for Stitch Magazine, blogged about vintage pieces I found interesting, repaired my favorite pair of jeans with stray bits of sashiko thread, and generally allowed sashiko to take over a happy portion of my life. *How has sashiko affected your life? Do you go crazy for colors, or do you seek out unusual fabrics for embellishing? Are you still getting by using embroidery floss for your projects? 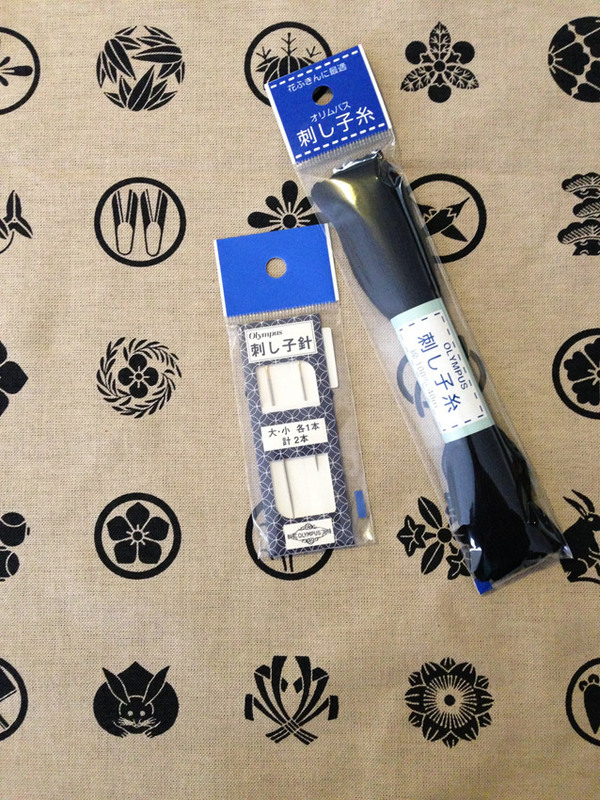 Post your experience here and I’ll pick my favorite for the sashiko sample pack above including needles, thread, and Wagara fabric. Deadline is Sunday, May 5, 2013. Tell your friends to get in on the giveaway! The bigger the response I have to these little freebies, the more of them I’ll do in the future. I’m heading to Japan in May and will be picking up loads of new goodies to share. I just found your blog thru your store, where i ‘m purchasing some fabric. I love how sashiko looks but my hands can’t do embroidery like they used to so i purchased a sashiko sewing maching. i know, some people think that is sacriligeous but oh, well!! wish i could go to japan with you. i’ll settle for winning some goodies!! i don’t know if it’s changed my life yet but there is still time…..
As you’re the only person to respond, you win the kit! However, since you say it’s hard to sew by hand, we can arrange something different for you, maybe just fabric? That is so exciting! I would like to have the whole kit – i can go slowly and not over due it. I’m so excited! If i can request a color choice it would be blue fabric with white thread. If not, that’s fine too; i’m just glad i won. Donna, please send your details to kimonomomo@gmail.com so I can send a kit to you. Thanks!